Bin Hammam received the ban last July. FORMER FIFA PRESIDENTIAL candidate Mohamed bin Hammam’s appeal against a life ban from soccer for allegedly bribing voters during his challenge to Sepp Blatter opens Wednesday at sport’s highest court. 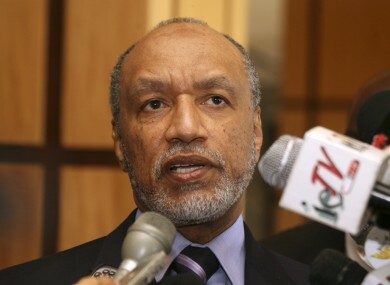 The Court of Arbitration for Sport has scheduled two full days to examine evidence surrounding Bin Hammam’s campaign trip to Trinidad last May. FIFA’s judicial bodies expelled the Asian Football Confederation president from world soccer, using whistleblower testimony from Caribbean officials who said they were offered envelopes stuffed with $40,000 in cash. The CAS panel is aiming to give a verdict this month. Email “Bin Hammam set for hearing as he seeks to overturn ban”. Feedback on “Bin Hammam set for hearing as he seeks to overturn ban”.